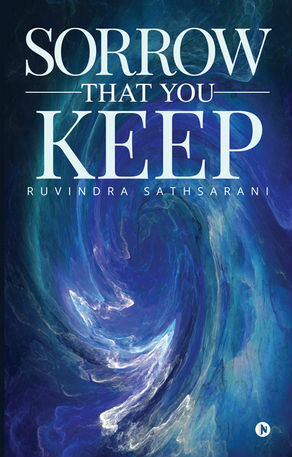 Recently I came across a book named Sorrow That You Keep by debutante author Ruvindra Sathsarani and here are my personal views for the same. Let us start with the cover page. As you can see the cover page is moderately good. It doesn’t go hard on the eyes and it doesn’t reveal much about the content as well. The book explores the story of Sue and Avi. Sue is a girl from Sri Lanka and is now moved to Rome where she wanted to go since an early age. She had an uneventful childhood in terms of personal joy and achievement. As a child she had seen increasing distance between her parents. Eventually, her mother was left alone as her father has decided to marry someone else and live abroad. Since than, her mother used to live the life of isolation. Her room was the world to her and she almost stopped talking to everyone, including Sue. She didn’t let the light enter her room. How Sue goes abroad, meet Avi, admired Sam and other stuff is explored in the book. In terms of literary qualities, the book is splendid. Here are some of the interesting lines from the book. 10 minutes later, a scream pierces the air. Then stillness wraps around the house like a defeated bird paralyzed in the jaws of a dog, succumbing to its fate of an obvious death. We try so hard to define and redefine our lives from the moments we collect, but unknowingly we leave traces of our presence in the lives of those who connect and live with us. Sue’s mother was good at hiding things; specially emotions and chocolate boxes. The book starts with a superb prologue and you will be thinking that a fantastic tale is going to be explored. But, the prologue is the best part of the book. The author is good at exploring scnes and makes you visualize it quite effectively. And, there are two thoughts about her literary abilities as well. The way she explores the death of Louis is simply superb. He talked of the traditions that are slowing fading away. …knowing that school girls her age was a good target for harassment in public transport. The author’s love for her motherland is explored at various scenes. The book then remains true to its title. It is all sadness explored almost throughout. You need to drag yourself to complete the book. Towards the end the things turns a little better. You can find some adult stuff in this book, and anyway, only an adult can take a challenge to read this book. Personally, I didn’t like the book. At a place in the book, the author explores the frustration of an author who need to write something which he doesn’t like. Probably the author is sharing her own thoughts here. There is one more scene where Sue has to write reviews for some stuff and she was writing the positive ones by not remaining honest. I would not recommend it. Though, the book has some fantastic attributes, I didn’t found it interesting as a whole package. Read it only if you love sad and tragic stuff. May be the author has tried to be more realistic. Everyone has his/her own choices, and you may like it.